Shares of chemical company (and top titanium dioxide manufacturer) The Chemours Company (NYSE:CC) rose 10.9% in March, after it and its former parent E.I. DuPont de Nemours and Company (NYSE:DD) were able to settle a large class of lawsuits related to the chemical PFOA (perfluorooctanoic acid) in mid-February. After the news of the settlement broke, the stock experienced a big jump, but it had languished since its late-February highs. All of the stock's gains for the month came on or after March 27, on no major news from the company. Chemours is the world's largest manufacturer of titanium dioxide, a white pigment used in paints. Image source: Getty Images. In the wake of the PFOA class action lawsuit settlement -- and it was huge, with the potential for tens of billions of dollars in liabilities -- several analysts, including Zacks, Jefferies, Citigroup, and Goldman Sachs, upgraded their neutral/hold ratings to positive/buy or even "strong buy" ratings. 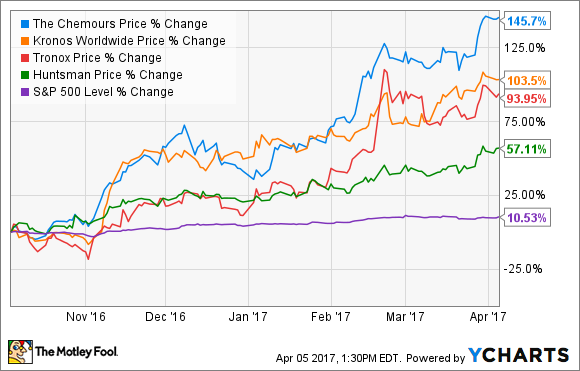 The ratings changes were all over the financial news in late March, and may have prompted the stock's rise. An improving market for the company's primary product plus the removal of a big legal stumbling block have made investors very bullish on the stock. Here's the thing: Even without the threat of big legal losses and an improving titanium dioxide market, Chemours is still a troubled company. When it was spun off in July 2015, its former parent DuPont loaded it up with liability not only for any issues associated with PFOA, but also for numerous other chemical and environmental issues. DuPont also saddled Chemours with $4 billion in debt. The PFOA liability may now be gone, but most of the debt and the environmental liabilities remain. The company's balance sheet is a mess. It's leveraged at 3.3 times its earnings before interest, taxes, depreciation, and amortization, with $3.5 billion in long-term debt and just $902 million in cash, $335 million of which is going to go toward paying its share of the PFOA settlement. Although it's likely that the stock price will move higher as the titanium dioxide market continues to improve, the fundamentals of the business should still give investors pause. Until Chemours can make real progress straightening out its balance sheet, there are safer places to put your money.